Edit: Added photo of glass ceiling, as requested. It has been raining in California non-stop for days. There were a couple tornadoes nearby, flooding, mudslides. Southern California especially doesn't do well in the rain. I was sitting in the lobby of my office building on Monday. The ceiling is made of glass. 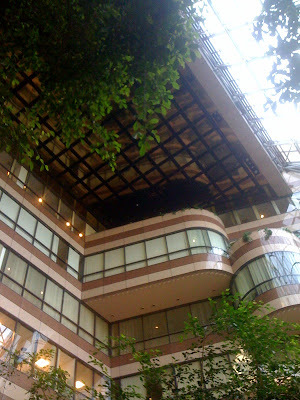 Who puts a glass ceiling on an office building??? The rain was pouring INSIDE. Not just a little either-there were 17 big trash cans set up to carch the downpour. I kept picturing the entire thing shattering, crushing me into a bloody pulp. As I stared at the streams of water in front of me, I got a text. My roommate said it was raining INSIDE our house. 4 windows gave way to the storm. She's a bit of a genius and had a set-up going to catch the water so no permanent damage was done to the carpet or to our stuff. I drive to work on the Pacific Coast Highway. Along the ocean side, most of the way, there are mountains jutting up right next to the highway. Rock slides made the drive a little terrifying. On Thursday, I followed a rock plow on the road for 30 minutes. On my drive home, there were a bunch of disabled cars on the side of the road that had been hit by boulders falling off the mountain. Yesterday on the same road to work, my check engine light came on. The car kept going though, so I didn't freak out. I'll take it to the dealer today to see what's wrong and cry only as I hand over my debit card when it's all fixed. For some reason, through all of this strangeness, I'm happy. Have been for days. It feels great to be happy- not that I'm usually mopey or anything. Just not truly happy. I'm more of a content person. The sun is shining today. Blue sky after so much gray. I'm happy to just be here, alive, breathing, safe, loved. 2009 was the year that I threw caution to the wind. I made living for the moment my M.O. When life handed me lemons, I tossed them into walls and smashed them, thinking maybe that would do some good. I don't even know how to make lemonade, so I wouldn't have given that a shot. Sugar. You need a certain amount of sugar to make lemonade. I'm just not that sweet. Half a year went by and I was in LOVE. Not with the man who was my boyfriend, unfortunately. With another man who had never really given me much reason to fall in love with him. I kept telling myself- give it up. This is never going to work. It may be for another lifetime, but in this one... no. He just isn't that into you. So I tried- I really did try to live like my heart wasn't torn into pieces. I maybe could have done things differently with this guy. Like maybe over the years, I could have told him how I felt or given him the option to fall in love with me too. But I didn't. I saw right from the start how impossible it was- us, we were impossible. Still are. So I made my bed and now I laid in it. So on summer solstice, I stood on a beach at 3? 4? in the morning and formally threw in the towel. I asked the universe for release from him. From a fantasy I had created in my head. But that didn't stick. And now, so what? So I'm still stuck on the dream that can never come true. Stifle it. I'm good at that. I'm good at moving on. Physically forcing myself to go out and live like this empty horrible feeling doesn't exist. I don't have any plans. Not really. I'm fluid. I'll keep doing whatever I want, when I want to do it. One moment of one day, I might feel like riding my bike along the beach to feel the sun on my pasty white skin and the wind in my hair. Another moment, I'll feel like having a nap. To go back to the dream. I don't even know really why I give this any more thought than it deserves. Suckit, dreams. Where have you gotten me, anyway? Precisely here. In a beautiful home with fantastic friends, a dog who makes me giggle and cuddles me even after I yell at him, a promising career, and a sad heart. My heart can wait. For the next lifetime or the one after. Right now, I have things to do, people to see. Or the other way around. I think I'm going to ride my bike now. Down the beach. Napping will wait until later. Unless I change my mind in the next five minutes.